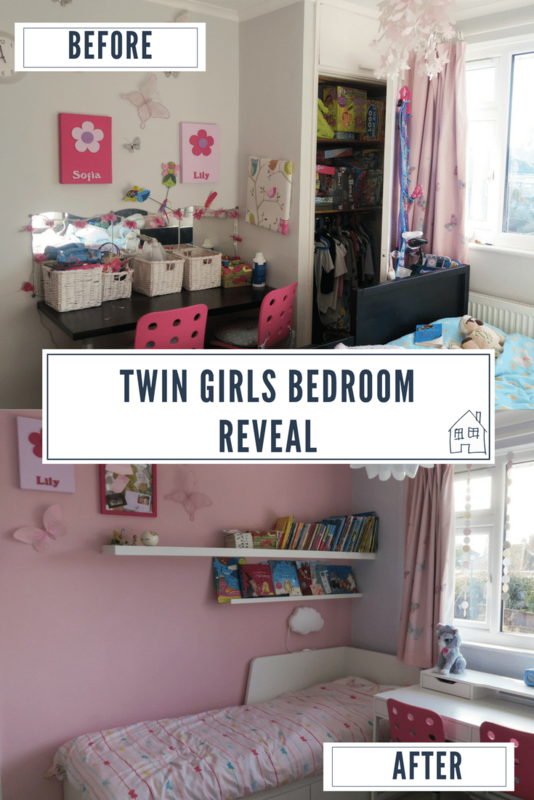 A couple of months back I showed off my ideas on my twin girls bedroom ideas, a pink and blue room which will give them lots of space, storage, areas of their own and a much prettier space. Well we did it! It took longer than I thought it would do, but we do everything ourselves, so life gets in the way! Here is after, what a change! As you can see what a difference!! We are over the moon with it, it has changed their life. I know, how dramatic, but it really has done. 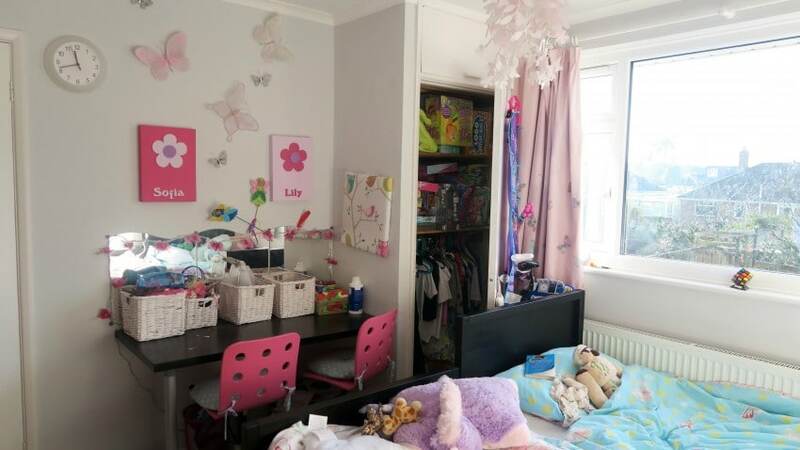 They now have a space that they can call theirs, a space for their toys, their clothes, and the colours they want. They can now be individuals. 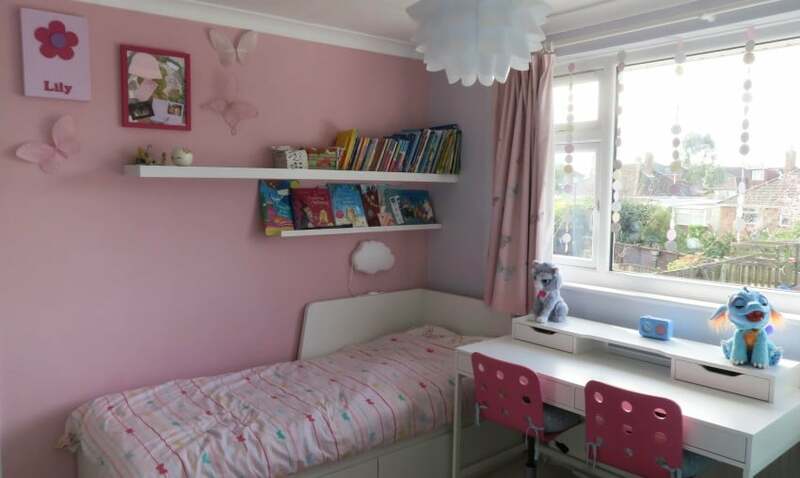 To think there was a huge old tank cupboard where Lilys pink bed is, removing this has created SO much room and we couldn’t have created this space and look if it was still there. I had so many blues and pinks to choose from! 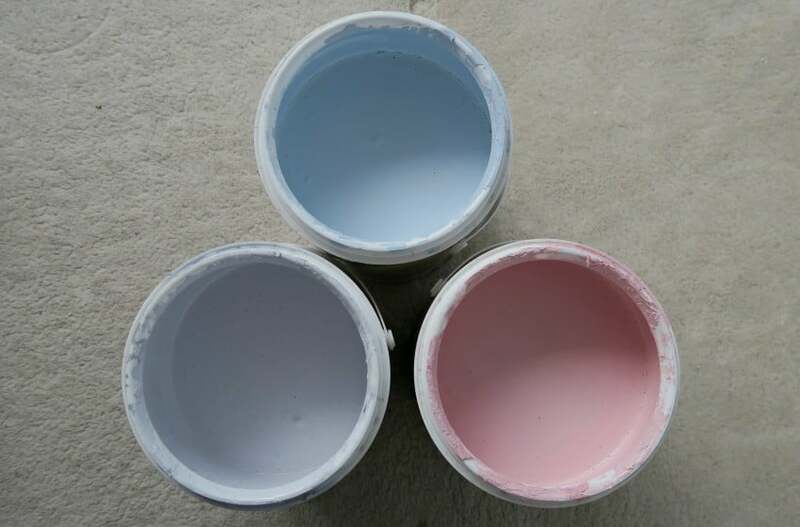 *Valspar paint comes in 2000 colours, so I wasn’t going to struggle to find a colour, just had to decide! I love Valspar Paint, it goes on so well, covers existing colours easily and you use less. 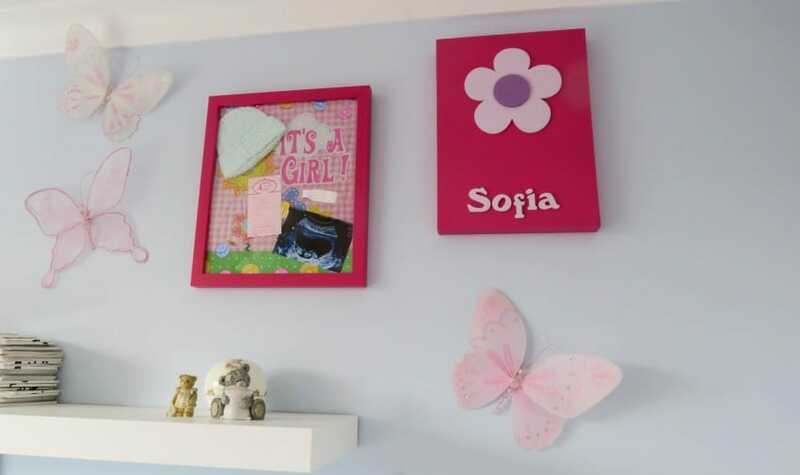 Lily wanted a pink wall, and Sofia wanted blue, that was the easy part! I then needed a colour to have on the middle walls, so went for a neutral grey. It is quite a bluey grey, but it looks lilacy next to the pick and blueish next to the blue. So it works well! I can call them a bed system because they aren’t any old bed! They are described as day beds in IKEA, the Flekke. We liked all the functions these beds have. 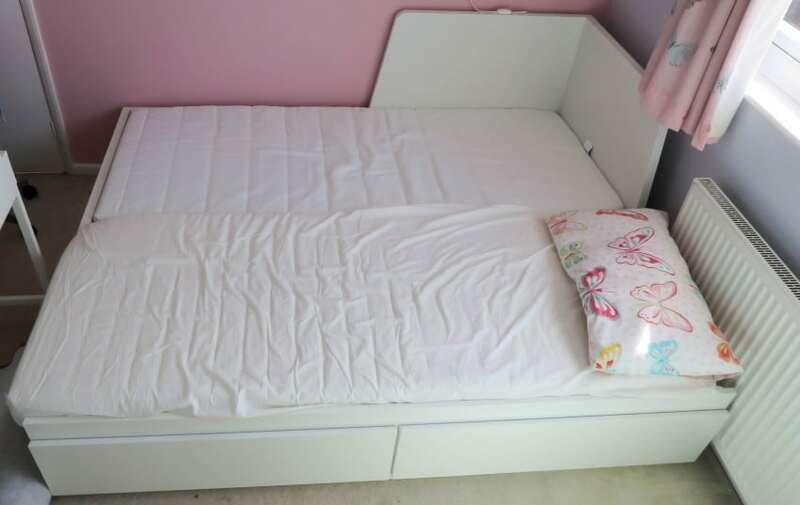 Headboards, single bed, double bed and 2 drawers. I didn’t realise you could get some many functions out of one bed! This bed solved all of our issues of their old room. Pulling them out to make a double bed is perfect for when they have friends over, or Kevs Mum stays with us. However they haven’t lost the storage underneath either. 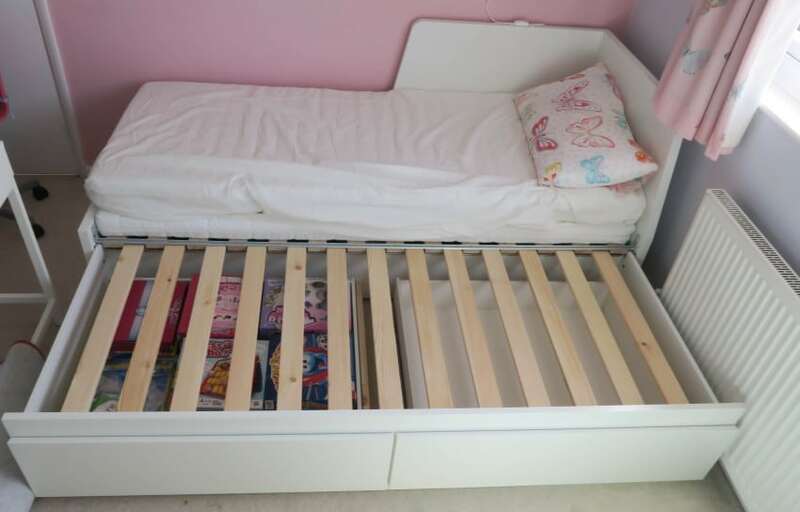 The bed pulls directly out leaving the use of the drawers. 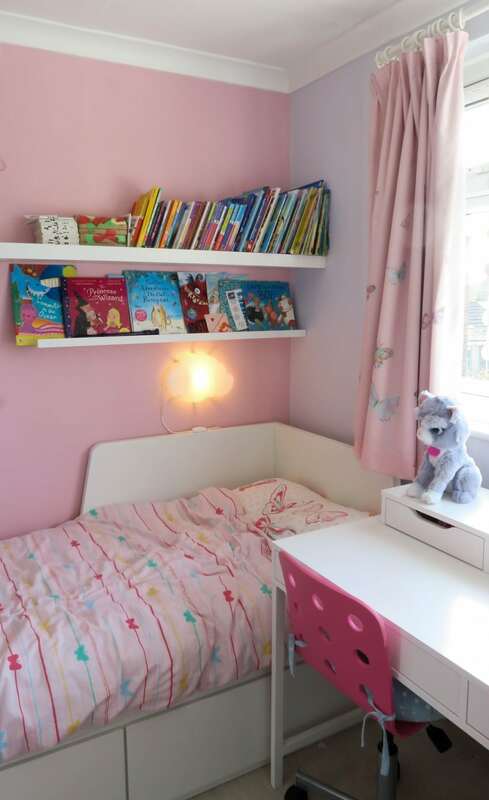 The headboards are built in, so they can sit up in bed and read. Wardrobes was something they were lacking in their room, they had hardly any hanging space and all their clothes were shared out between some drawers. 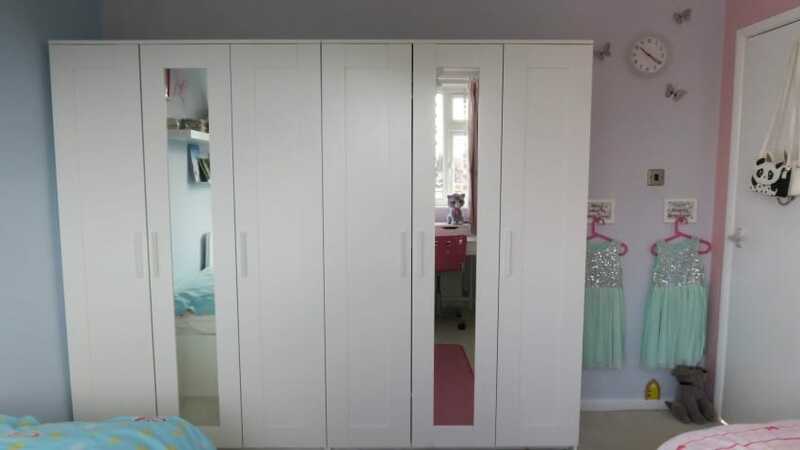 Now they have a triple wardrobe each! With a large hanging rail, which I use the IKEA hangers in. With storage boxes on all available shelves to fill up with vests and tights. Along the bottom shelf they have some IKEA Flarra fabric boxes where I store their pants, socks and PJ’s in. Behind the 3rd single door, they have 4 big fabric boxes from IKEA, here is where they can store all their toys in. 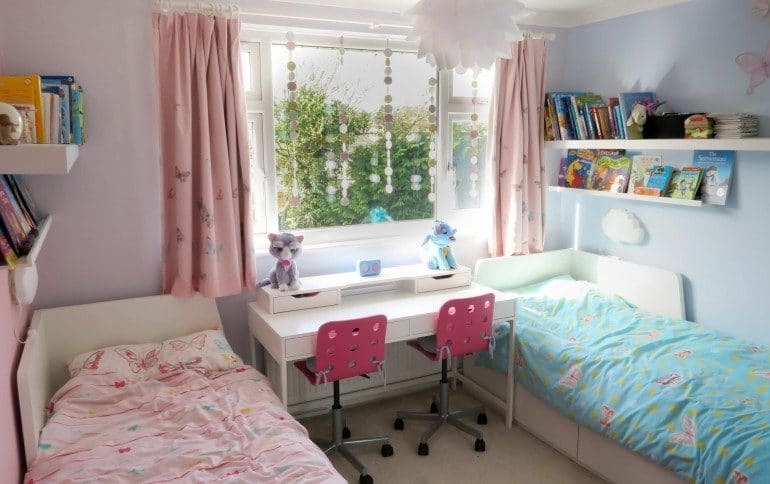 I think it is important for them to have a desk in their room, my son uses his so much for doing his homework on, and storing all his bits and bobs. The girls love colouring, and will spend so much time drawing, writing and colouring in at their desk. We had to change our original design of desk for them, as the other 2 smaller ones didn’t fit in between. So we went for one large one instead. They still have a drawer each and a nice area where all the cables are hidden down the back too. It also meant we were able to pop the additional add-on desk on top, this adds even more drawers. I store all their hair bows, bands and hair brushes in these. As they get older I could add a mirror on this too. They love the book shelves, they spent a couple of hours going through their old book boxes choosing which book they wanted on their shelf (and having a good read as they went along!) and which ones were special enough to go on the book ledge. This book ledge is a picture frame ledge, but it works great as it isn’t as deep as the lack shelf above. It can be placed nearer to them, and not risking them bumping their heads on it. They have easy access to the books they are currently reading, or not losing the school library book for the week! Next to their bed I purchased a little cloud light which gives them enough light to read in the evenings. I didn’t expect this light to give off so much lighting, but with both on they softly light up the whole room. 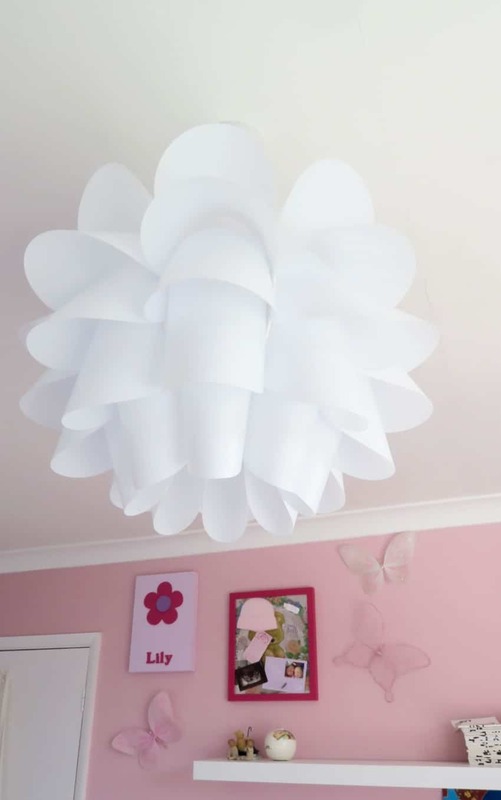 On the ceiling we have a IKEA Knappa ceiling light, I wanted a white lampshade as there is enough colour in the room. I quite like the shape of the shade, like wings of a butterfly. The top Lack shelf is nice and long, this can be filled with books, or add their trinkets and things I want to keep safe. On the wall above is some word art. The name art is from KidsFootPrints which is no longer around, they have had them since they were born. I worked with eframe a while ago, and I put together a memory frame, full of their little bits from when they were newborn babies. They had their little prem baby knitted hats, a lock of hair and scan pictures. 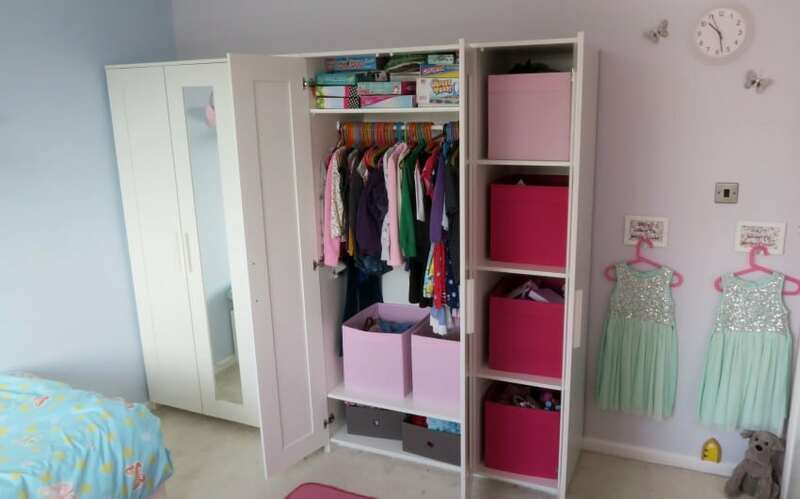 I was pleased these still fitted in their new bedroom. 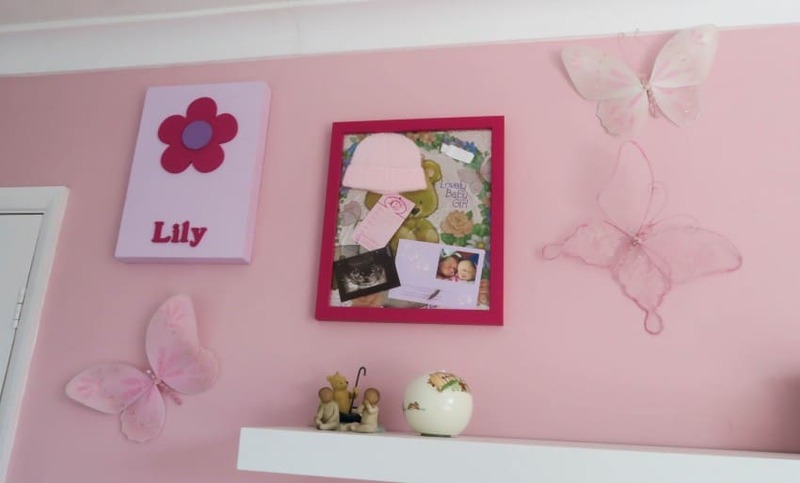 Your see some butterflies dotted around on the walls, these are very pretty and stand out from the wall. I got these on eBay, search for wire butterfly, and you will find lots of different colours and sizes. 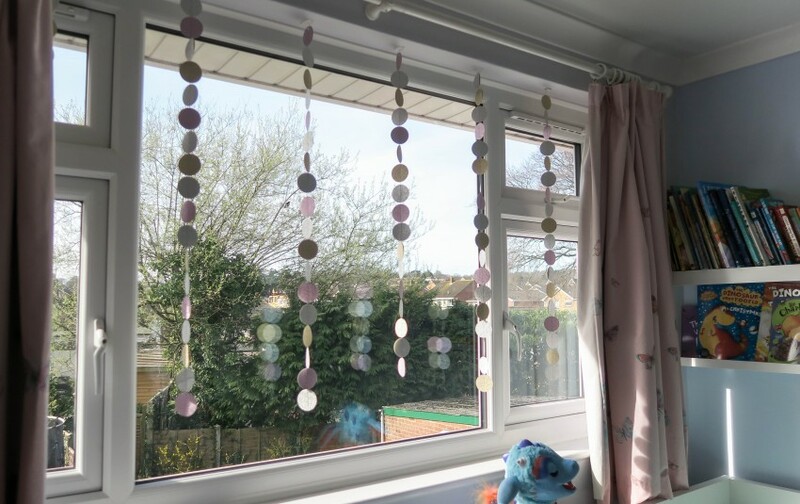 Then we have the garlands hanging from the window. I thought it made it a bit more interesting, and can easily be changed over time. I made these from wallpaper samples, and stitched together (blog post coming soon) to create this! 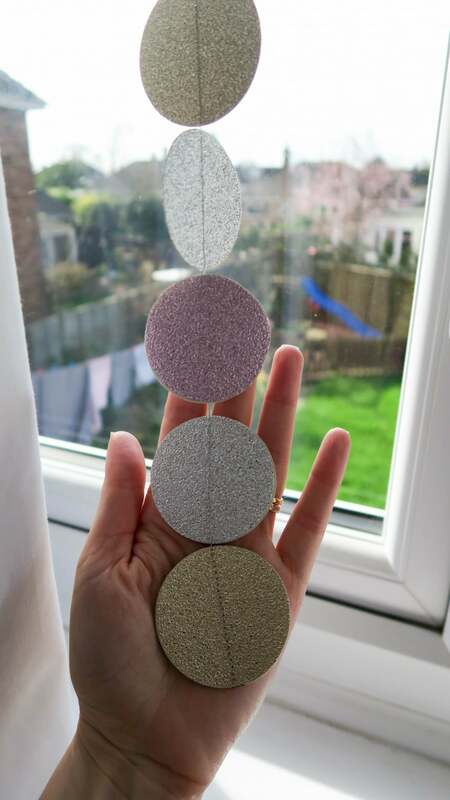 They love them, as they are sparkly and fun. Look at this cute little door stop, now you wouldn’t think the girls would be so excited by a door stop, but they are!! 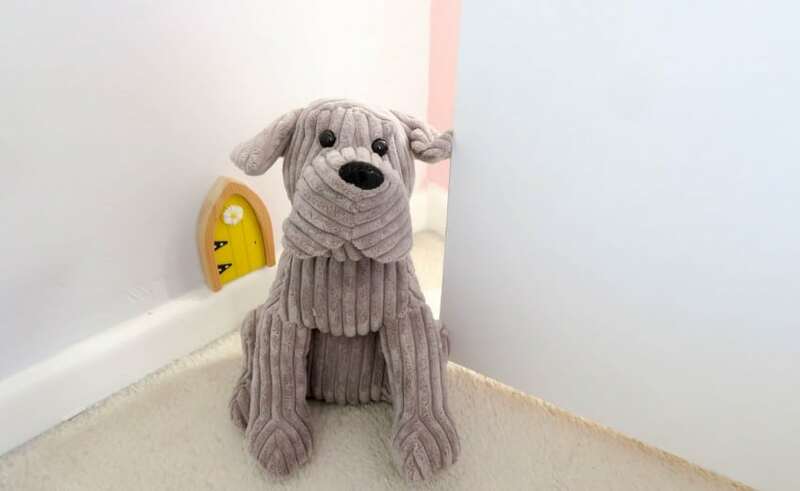 This cuddly corduroy grey dog door stop is from *Hetty & Betty, he is heavy enough to sit by the door and stop it from swinging open, but soft to touch and looks very cute sat in the corner of their room. I love him too! 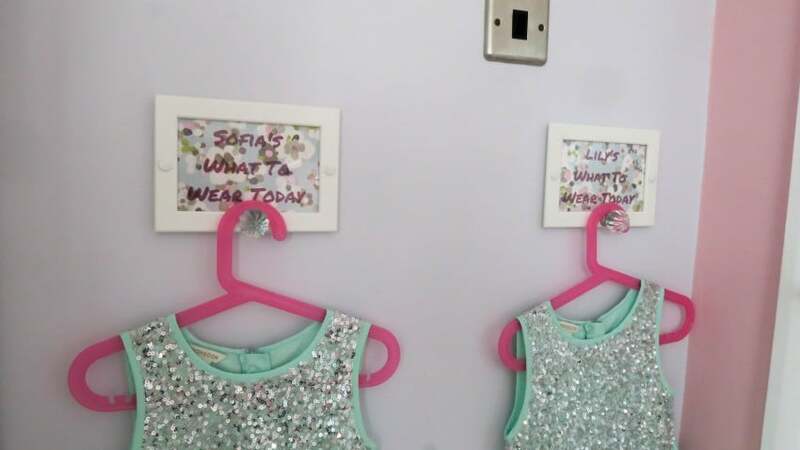 ‘What to wear today hooks’ these are so good to have in a girls bedroom when they are sharing. Shame on me, but I don’t get the girls to wear a new uniform each day. They can wear it a couple of days, unless they’ve poured something down it, or look a mess! So when they come home from school they must get changed and hang up their uniform. Well instead of it getting mixed up, or left on the floor, they hang them straight up on their hooks. All ready for the next day! 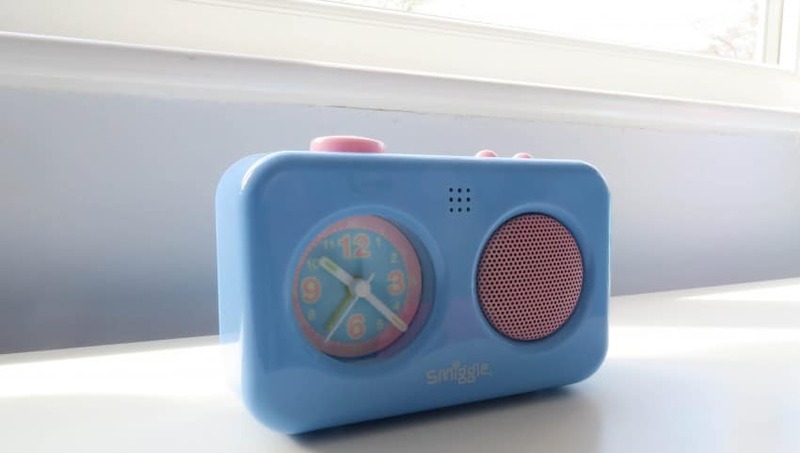 This little clock is from *Smiggle, they love it as they can record a voice, or music and that can be their alarm instead of a beep! 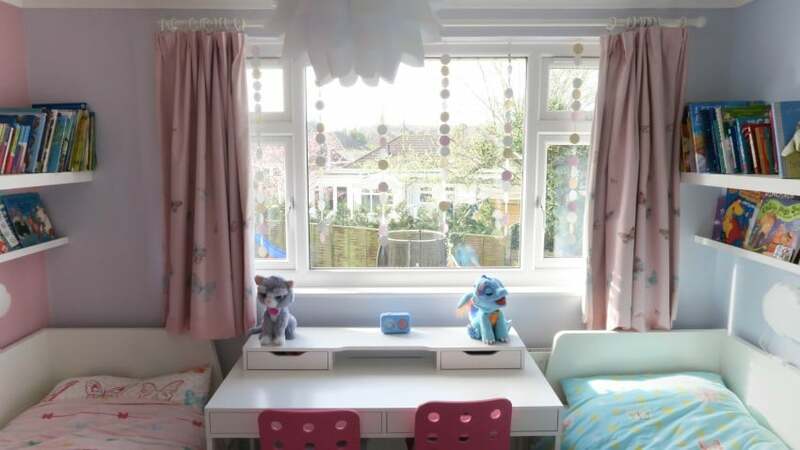 I hope you like my twin girls bedroom, we are over the moon with it. Thanks for my husband for all his hard work, my nagging and the mess that it has cause to the rest of the house! *Items marked with a * have been sent to me recently or in the past for review or collaborations. However my posts are honest and I would only share items that I love myself. Hi! I just wanted you to know that I have nominated you for a Liebster Award. 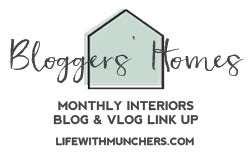 You can find out more on my post. Congratulations and have a wonderful New Year. that’s so lovely – looks great! Thank you, they are over the moon with it. So much happier in there. So beautiful aren’t they, they are from Monsoon. I am sure they will clutter it up soon! However now they have cupboards that you can shut things away more so fingers crossed it will stay nice! Thank you, they are so different that I HAD to do a different colour scheme!! They love it, so it works well for them. This is such a cute room now. I love it and I bet that they are so happy with it now! Thanks, they are SO happy with it. Thank you, they have so much more room! 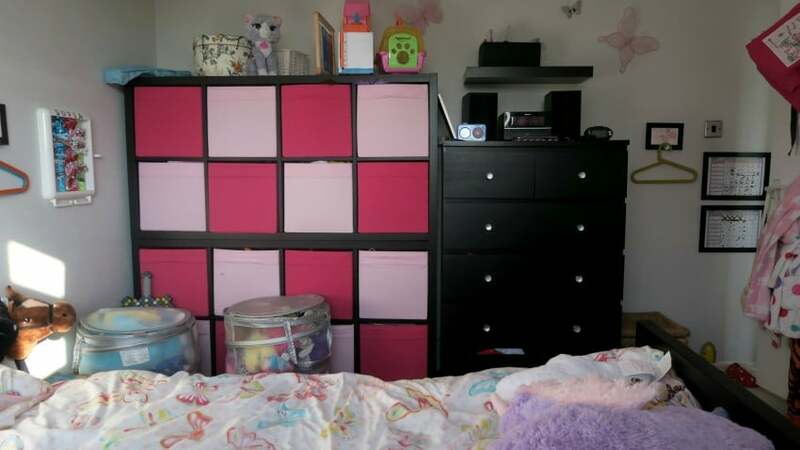 Thank you, they love it and so nice to do a girly room! 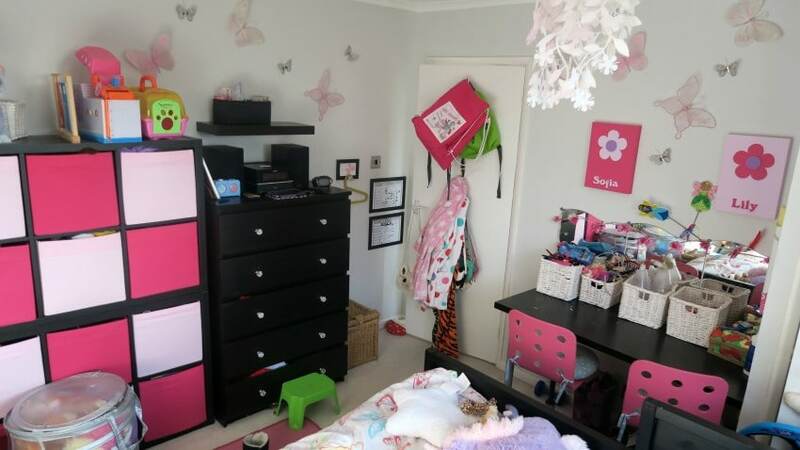 Their room is looking lovely now, they must be thrilled! 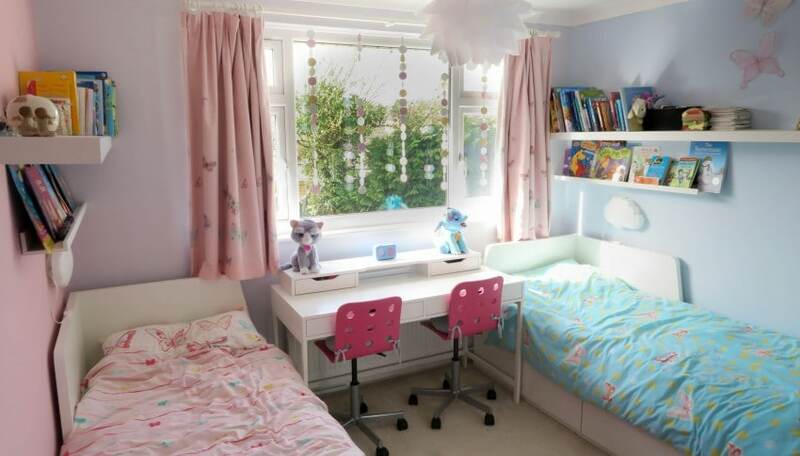 I love the books being in easy reach above the beds and the desk with space for two. A great job, well done! Thank you. They are reading so much more they are within easy reach, so that’s a success! The IKEA hangers are great! Also having their pants and socks in little baskets helps them to get easy access to them. Thank you, it is nice to indulge my girly side!! They come up with great ideas don’t they! 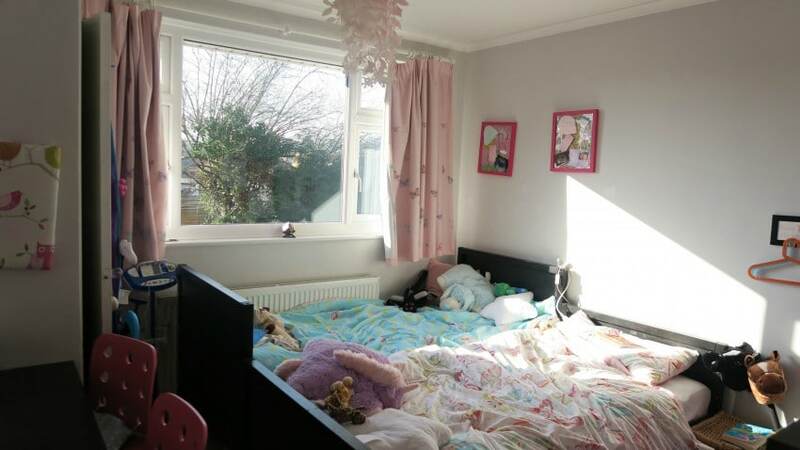 It looks great- we’re int he middle of doing the toddlers room and it definitely takes longer than you think! lol. How adorable and what a transformation. I love the paint choices – they must be thrilled! Thanks, they are so happy with it. So much more room in there, and much brighter. I love it too!